Learn to lower; bur first this she must be reliably picking up the tail after releasing the sally, and able to crawl up and down the rope with both hands or left hand alone without looking. Set her bell ten times in a row. Raising. She raised the 4 three times. Bobbie was thinking through a lot of things today which interfered with her ringing, but all in all made good progress. We set up times for some intensive work over the next couple of weeks and I expect she’ll finish the class shortly, possibly before the last of the sessions we put on the calendar. New learner Jorge · First class. He did very well. We worked for three hours, including talking. Up to see the bells, and remove the muffle since it was after noon. Pulling off; rope stretching, bell off the stay, bell crossing the balance; look to – treble’s going – she’s gone. Backstroke only. He got this going while picking up only one bad habit (left hand angled at the top of the stroke) and worked through it to a large extent. Like nearly all learners he was too tense, gripped the rope too tightly, and overpulled, but improved markedly on all the points. Handstroke only. Good progress, no bad habits picked up. Like most learners he did not follow through adequately after the release. He can do it, as we learned when we tried the instructor’s-hand-chopping reminder, but struggles to make it happen unless forced (by the chopping hand). We’ll set up the next sessions once he checks his calendar. Ann, who was recruited by a friend in the congregation. Update: Ann has withdrawn. Ann started classes and Amy resumed classes on 2013Jan19Sa. We already have an Anne in the band, so by the time Ann graduates to ringing with the band we’ll have to come up with distinct ways of referring to them. We welcome new ringer Bobbie! She recently moved into a condominium within the sound of the bells and decided she wanted to learn to ring herself. 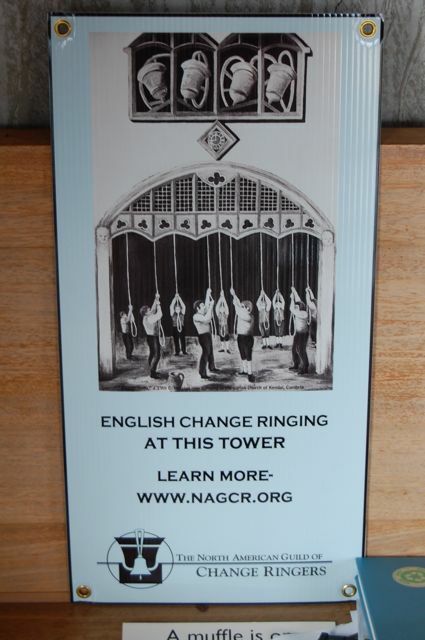 She saw the NAGCR sign (right) by the entrance to the sanctuary and then our window sign, and contacted us. Her first class will be Jan12Sa. Carroll’s friend Nancy has been accompanying her to new ringers classes. While Carroll took a breather during today’s class (ringing done with good form is exhausting for a new learner), the instructor invited Nancy to take a try. Nancy pulled off the 4 three times under supervision, doing very well, and decided she wants to learn to ring too. Nancy will start as soon as the instructor has time to start another class, probably in a week or so when Anne no longer needs individual instruction. A fourth new ringer will begin the current cycle of classes. Carroll will visit the tower to see service ringing on Sunday, then her classes will be Tuesdays 5-6 and Thursdays 6-7. Carroll learned of the new ringers classes through a recent article in the Miami Herald, and phoned the Cathedral to get things going. We welcome new ringers Barbara and Eoin! They learned of the class through the weekly Trinity Cathedral email, and will begin the new ringers class tomorrow. To accommodate their availability, the class will meet Mondays and Wednesdays rather than Wednesdays and Saturdays.